A woman who deliberately ran down three “feral” teenagers after one of the hurled a milkshake at her car was today spared jail. Catherine Sutherland was called to a McDonald’s restaurant in Dundee city centre to pick up a young family member who had been in an argument with the group. She parked up and got out of her car to remonstrate with the group – an altercation caught on camera by an onlooker across the street. Footage played at Dundee Sheriff Court showed one of the youngsters spitting on her car after she got back into it – before another hurled a milkshake at the vehicle. Sutherland then backed up and pointed her motor at a group of four kids – before mounting the pavement and deliberately driving at them. A sheriff told her the group she had driven into had acted in a “feral, aggressive and offensive manner” towards her – but that “did not excuse her actions”. But he spared Sutherland jail – instead ordering her to carry out unpaid work in the community, be subjected to electronic tagging and banned her from driving. Fiscal depute Saima Rasheed told the court Sutherland had struck three of them – a 13-year-old boy and two girls aged 15 and 13 – throwing them back across the pavement towards a building. She said: “She was upset and she got out of the car and confronted the complainers and an argument ensued. “The accused then got back in the car and closed the door. “One of the group then approached and spat on her windscreen and a milkshake was then through over the front passenger seat. “The accused reversed a few feet and come to a stop. “She accelerated forward and turned towards the group and mounted the pavement. “She drove towards them and struck all three, throwing them backwards towards a building. “The male complainer was seen hobbling towards a doorway was also observed holding his leg. “The accused then exited her car and began to argue with the youths. The court heard two of the children were taken to hospital but later released after being treated for minor injuries. 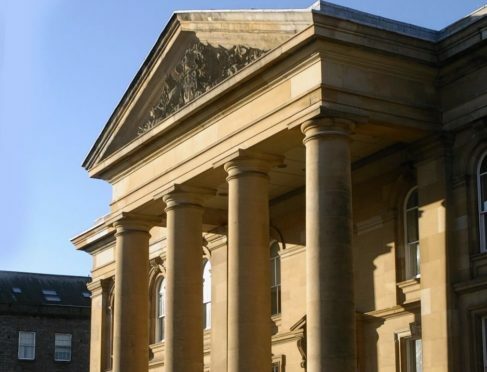 Sutherland, 35, of Finlaggan Terrace, Dundee, pleaded guilty on indictment to a charge of assault to injury committed on December 4 last year in Reform Street, Dundee. Defence solicitor Doug McConnell said: “The youngster was effectively being bullied by a group of youths and she was called to attend. “When she arrived she got out of the car and remonstrated. “All she got was a torrent of abuse. “She got in to the car and she just loses it. “This group wasn’t scared of her – they were trying to provoke in that they were shouting and harassing her and her family in the car. “It is no excuse but something just snapped. “This is completely out of character for her. Sheriff Alastair Carmichael imposed a community payback order with 120 hours unpaid work and banned Sutherland from driving for four months. He further imposed a restriction of liberty order confining her to her home address every night on an electronic tag for four months. The sheriff said: “You drove a car at a group of youngsters and as a result three of them were struck and sustained minor injuries. “It is clear from the CCTV that before you did that certain members of this group of youths had behaved in a feral, aggressive and offensive manner towards you.